While I'll be blogging more about the significance of the OMA's call to action early next week, today's blog's a quickie. Have a gander at the photo up above. That's the warning label that the OMA wants to place on grape juice (and presumably other juices as well). 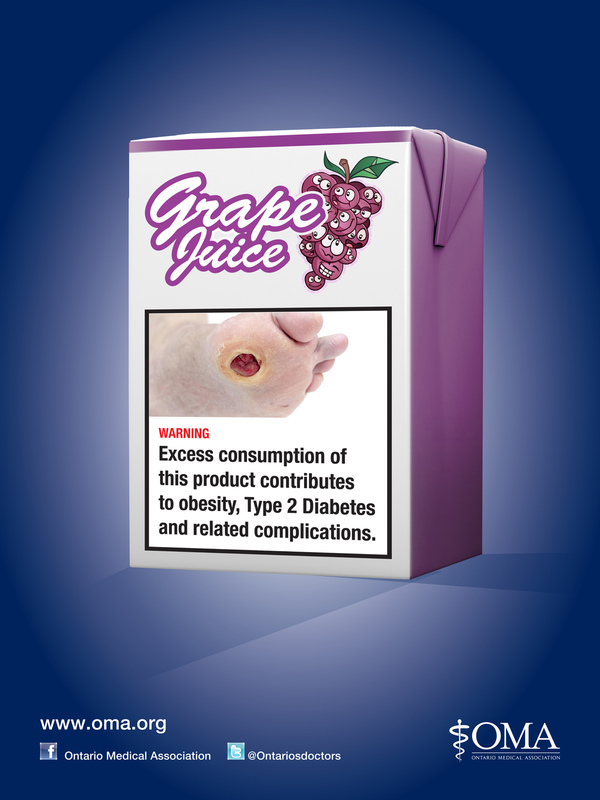 They want a warning because there's risk to the regular consumption of grape juice - a beverage I've labeled the world's least healthy beverage - in that it contains roughly double the calories and sugar of Coca-Cola. 10 ridiculous teaspoons of sugar per glass. As far as I'm concerned, the only options that would explain the Heart and Stroke Foundation's endorsement of juice as something that contributes to an overall healthy diet are, ignorance, pigheaded stubbornness, or greed. And given the American Academy of Pediatrics and Canadian Pediatric Society have both long ago come out to recommend a half cup juice maximum for younger children and 1 cup maximum for everyone else, I'd say ignorance is the least likely option.